Since it’s founding in 1973 Williams Coaches has gained and maintained a reputation for quality, friendly and reliable service at a reasonable cost. Whether it’s a week away on holiday, a day trip to the sea side, an evening out, a business trip or an educational visit we have the vehicle and driver for your needs. 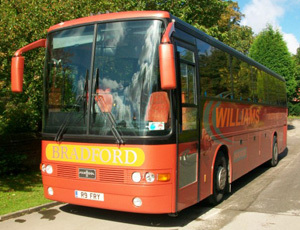 Email us on info@bradford-coaches.co.uk to discuss your requirements in more detail.